This behavioral economics podcast episode is the final installment of my series on the five senses. We’ve already talked about sight, smell, taste and hearing. Today, we dig into the sense of touch. Touch is one of the topics that I’m the most excited to share with you. Touch is directly connected to buying behavior in a way that is fascinating to behold. We value things more once we have touched them, and the triad of the endowment effect, perceived ownership and loss aversion are triggered directly by touch, which I will get into during the episode. 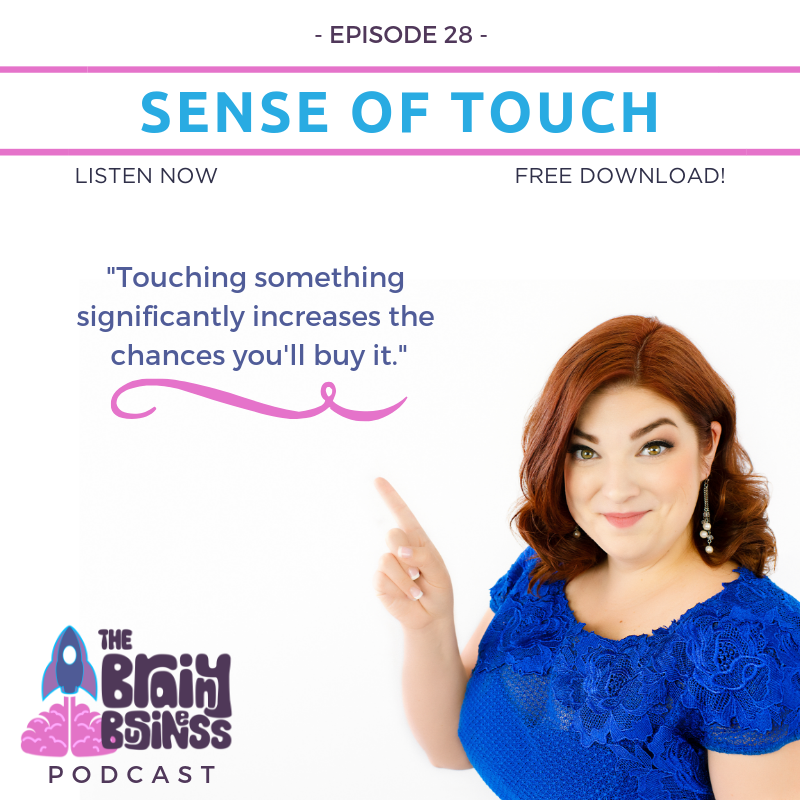 I talk about how touch works and share scientific studies and real life examples that will help illustrate how this fascinating sense can be incorporated into your business. [07:32] Touch is directly connected to buying behavior in a way that’s fascinating to behold. [08:23] Touch is directly linked to emotional language. [09:05] We can get along without most of our other senses. It’s not the same with touch. [09:59] Our sense of touch and having contact with others is important for development throughout life. [10:45] Touch is the social glue that binds us all together. [11:17] Touch is important for the development of people and societies. [12:07] Developing emotionally makes one more receptive to touch. [12:44] The wisdom of Dr. Seuss. [13:33] Our skin has many nerve endings. These nerve endings have different jobs. Fingertips have nerve endings for pressure, and that is why they can read braille. [15:27] If I asked you if water was hot or cold your answer would depend. As with the truth about pricing (where it isn’t really about the price) – it’s not about the water and its temperature, it’s about everything leading up to the touch and temperature that matters. [15:52] Nerve endings are different than emotional touch and sensation. [17:13] Emotion and touch are very closely linked, and we form bonds with the way things feel. [17:42] TEAMWORK – Human contact is important to our development throughout our lives. [18:04] Touch has been shown to impact the overall effectiveness of teams. [19:01] Waitresses who touch the arm of a patron in a platonic way (whether they are male or female) have been shown to get more tips. [19:40] Providing comforting touch is part of who we are as humans and it impacts our relationships and how we do business. [19:52] Use touch with caution and make sure you are always incorporating appropriate touch. [20:32] Whether we realize it or not, the texture of the paper an item is printed on says a lot to our subconscious about the business as a whole. [21:47] That first impression is everything and could be impacting every decision from that point forward. Invest in high quality materials that reflect your brand and message. [22:38] If you want to show you are out of the box there are many options – I have gotten wooden and metal business cards and they definitely say something about the person who gives them to me. [22:54] Think about everything that is physically touched. They all say something about your brand. [23:54] Merely touching an item greatly increases the ownership over that item. [24:29] Our brains want us to reach out and touch things. [25:28] Smart companies know that touch increases purchases. [25:58] Far too many stores neglect the power of the dressing room with poorly-lit, messy dressing rooms. [26:34] A personal shopper is a very easy way to experience the clothing and decide what you like. People would buy more if every store experience was like this. [28:04] Advice from What Not to Wear. Color, pattern, texture, and shine should be incorporated into every outfit. [28:21] Texture matters because we can see what something might feel like with our eyes. This creates visual interest and appeal. [29:51] Similar to the paper you print things on, texture and the power of touch are actually a big influence on how people perceive you…even if they will never touch your outfit. [30:24] We can emotionally “feel” something with our eyes, and it helps us to make decisions about the person in front of us. [30:39] The feel of a piece makes a big impact on purchase behavior. [31:28] Think about your packaging also. [31:54] The power of touch without touch – the benefits of envisioning yourself touching an object or an image of an object. [33:31] Well-chosen words can make your brain trigger its texture centers so you are responding as if you were touching it – triggering perceived ownership, loss aversion, and an increased likelihood of buying. [33:48] The truth of the matter is this – touch – whether it is actually happening in your hands or simply in your mind, impacts sales. [35:24] BRAND – Brands need to think about the way they make people feel and how that ties in with their overall experience. [36:00] The materials you choose for everything you do – from physical products to chairs in the lobby and business cards, postcards and letterhead all impact the perception (and likelihood of buying). [36:58] All the senses are impacting our lives much more than we realize.